We're becoming huge fans of nature walks and scavenger hunts; round our garden, at the park or to the local nature reserves and forest areas. It doesn't really matter where; the rascals love to take along a basket and wonder around looking for and collecting things that take their interest. We're currently approaching the final weeks of winter here in New Zealand's south island. Our garden isn't exactly bursting with color, or at least that's we thought until we made this rainbow collage from things that we found in our own garden. So this may not be a typical representation of a rainbow; but we're pretty impressed by the variation in colors and how nicely they sit together in a rainbow pattern. It's pretty amazing what you can find when you really look. An important lesson for the kids to learn when it comes to really noticing their surroundings. We collected autumn leaves, of which their were still plenty clinging to some of the hedge line trees, and green leaves from some of the ever green shrubs. There were plenty of daisies through out the lawn (there always are! ), and some tiny white flowers from a plant that I'm sure is a weed. Finally we were lucky enough to find a single 'early' yellow rose, which although it pained me to do so, I agreed to its removal for the purposes of our project. Haha!! The added color came from some red rhododendrons, from a previous nature walk and some dried flowers and petals which I had purchased from our local $2 store; the kind that are used for potpourri. To make this a completely recyclable piece of artwork. 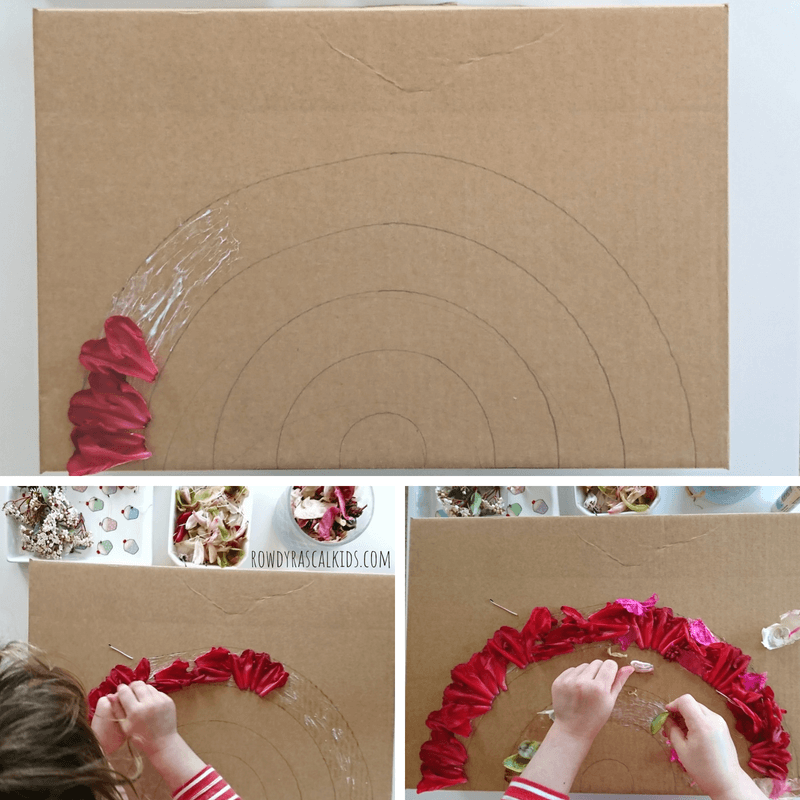 I used the bottom of a cardboard box as the base for our rainbow template. Using a pencil tied to a piece of string, I placed one end of the string in the middle of the bottom edge, held it tightly with my finger and traced a semi circle with the pencil that was attached at the other end. Each time I lengthened the string ad traced another semi circle until we had what resembled a rainbow. Using a glue stick, the kids pasted glue into the base and began to stick the different colors onto the rainbow. They love using glue, so this activity kept their little hands busy. They cam and went from the table throughout the afternoon and I have to admit that I quite enjoyed working with them and adding my own bits and pieces to their collage. It was truly a collaborative piece of nature artwork.